Okay, here’s a mystery that needs an answer. Or maybe a couple. It seems that back in the 1800’s when Toledo city workers were doing some excavating along Monroe Street in the downtown area, they came across an ancient stone carving. It was the carving of face and it appeared to those who saw it to be the face of an early Native American, or a person with “thick lips and round face”who was deemed to be one of the “ancient” pre-historic people, known as mound builders. This little gem has come my way from a book given to me by a friend who found the 1922 book it in a garage sale near Dayton. The book is entitled “Memories” by Dr. Cyrus Noble of Toledo who practiced medicine in the early part of the 20th century in Toledo and Wood County. Dr. Noble was also a poet and observer of life in the area and his poems reflect on a number of local stories that piqued his curiosity and interest. In “Memories” he writes fondly of the famed “Indian Elm” in Maumee. A giant among trees where Indians reportedly perched to take aim at soldiers across the Maumee River at Ft. Meigs. Dr. Noble also waxes lyrically about a variety of topics, but the one that snared my curiosity was the story of the “Great Stone Face”. There wasn’t much of a narrative about it, but there was a photo of it, presumably where it was exhibited for years inside of the now-forgotten Dixon Inn in Toledo’s old Tenderloin District. The Dixon Inn had been a brothel at one time, amid the clutter of the “sin zone” but after the Tenderloin was closed down in 1918, the Dixon Inn stayed open as a hotel, inn and boarding house, and more importantly – a very strange museum. I have written about the Dixon Inn before in the Gazette, and its odd collection of bizarre artifacts, from shrunken heads to ancient battle weapons. But the “Great Stone Face” is the stand out among the collection, for if it is truly an artifact of ancient heritage, it conjures a list of questions, the first being how it came rest 20 feet below the surface of earth in the area of downtown Toledo? One might wonder what else is still down there to be discovered? If there are any folks who can offer some educated speculation as to the origin of this “face” or any other information about it, please share them with us. My search efforts to excavate more about information regarding the “face” have turned up nothing specific, but other stories regarding carvings found in other areas of the country. In fact, the discovery of human effigy artifacts from the “mounds” in Ohio and other Midwest sites in Illinois and the Mississippi Valley are well established, but Toledo was not known for an abundance of such mound building activity, although, there were, as I have read, some small “mounds” discovered in the downtown area near the river upon arrival of the first pioneers to the area. So how did this carving get to Toledo. It was offered by some that it could have been transported here centuries ago from another area and left with those ancients living on the Maumee River. When looking at the photo of this particular “stone face” at the Dixon Inn, it does not resemble the others I have seen, but looks more “finished” or finely sculpted. Thus, some shades of skepticism darken my door of belief. What do you think? Where would it have come from? How did it get to Toledo, and what ever happened to it? I have found from a newspaper reference that it was part of the Dixon collection that was auctioned at the Dixon Inn around 1925 after the owner died. The Great Stone Face of Toledo seems to have disappeared in the past century, leaving me to wonder whether the carving was really the product of someone perpetrating a hoax and merely had been the handiwork of a con artist or someone with a sense of history and humor. That is certainly possible and let’s face it, the Dixon Inn was not exactly the Smithsonian. Despite the questions and the doubts, Dr. Noble seemed convinced of its historic gravity and message when he penned his poem in 1920, about Toledo’s Great Stone Face. and it could talk to me. and dragged it to the ground. they buried it beneath the Maumee’s sand. when Noah built his ark. Came to this wondrous face. and ponder over its handiwork of men of other days. Now sleep beneath the ground. 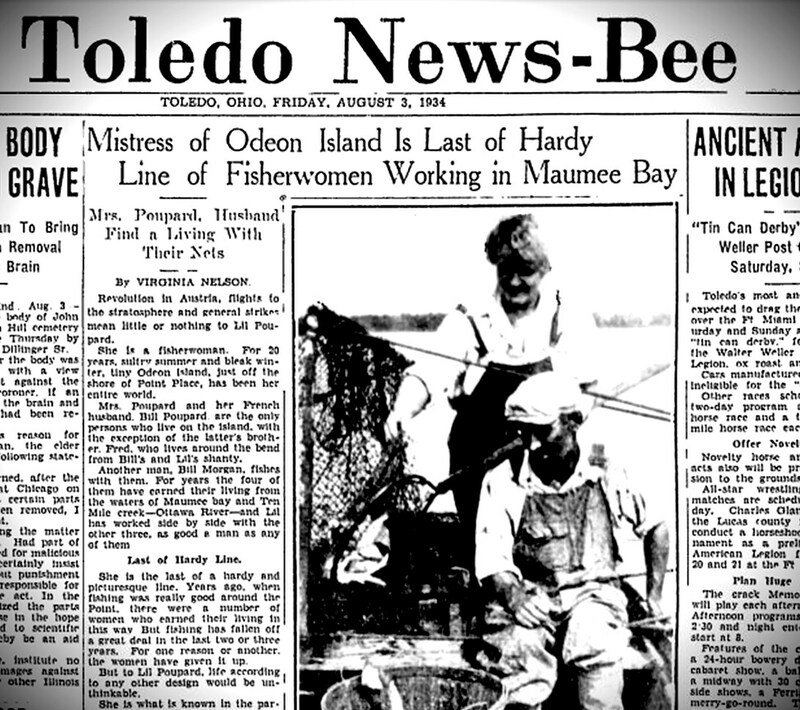 A story that caught my attention while I was researching my book, Day by Day in Toledo, was that of Lil Poupard, a woman that the Toledo News Bee dubbed the “Mistress of Odeon Island”. In an 80 year old article from August of 1934, the News Bee featured Lil and her husband Bill Poupard who were two hardy souls that lived on this little spit of an island just off Point Place and made their living catching and selling fish. They resided there on the tiny island, not just in the balmy and gentle days of summer, but throughout the year, even in the “bleak” days of winter, living in a small wooden structure, a shanty they called home. They were the sole inhabitants along with Bill Poupard’s brother Fred who is said to also have lived on island. The story piqued my interest on a number of levels, first I was curious as to the whereabouts of Odeon Island. 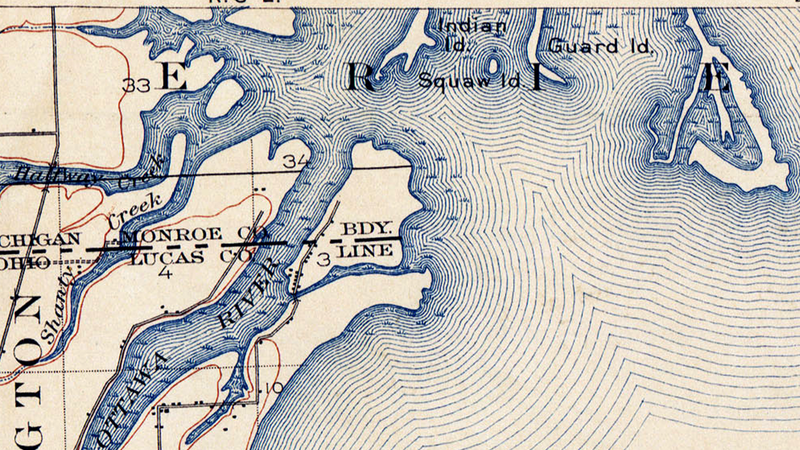 You won’t see it on a map today, but what you will find are Indian and Gard islands, just off the northern most tip of the Point Place peninsula at the mouth of the Ottawa River. I am told by area historian Buzz Achinger of the Lost Peninsula that Odeon Island was the first name for what is now Indian Island. ” It is a distinct island of its own. It is less popular than Gard and the other surrounding islands because it can be treacherous around its shores. There are shallows that can trap boaters in the summer and springs & soft spots that cause havoc for snowmobiles and ATVs when the area is ice-covered in Winter. It is a natural island, not man-made like a few other island nearby.” Buzz also tells me that not much is there these days and that he doubted if the old wooden structures of the Poupard’s remained. I have placed an historic USGS map to show you the relative placement of the island just off the mouth of the Ottawa River. But eventually something did change for the Poupard’s. Just when and how, I have been unable to discover, and perhaps you or someone you know can shed some needed light on this story’s dark evolution. What I have been able to determine from Blade and News Bee articles is that sometime between 1934, when the News Bee feature appeared and the Spring of 1939, Bill Poupard would find another woman to share his life with on the island, a much younger woman than Lil. And whatever plans they had for matrimony were cut short But by tragedy. 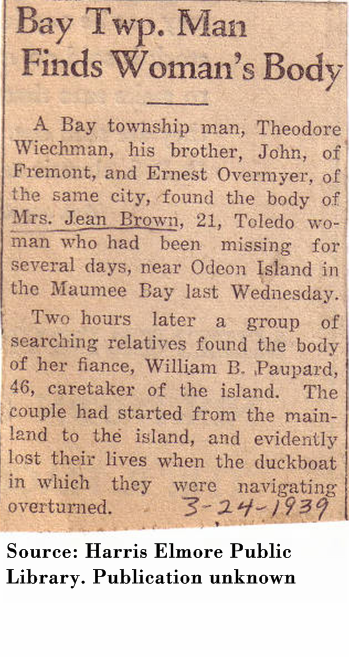 According to a newspaper article, the body of 21-year-old Jean Brown was found in the waters of Maumee Bay near Odeon Island by two duck hunters. the article says she had been missing for several days when her body was found. The news story also states that the body of 46-year old William Poupard was found nearby by relatives of his who had been searching for him. Poupard was described as the caretaker of Odeon Island. The story says that the Poupard and Brown were on their way to mainland from Odeon Island when their duckboat overturned. I suppose, we could leave the story there. But my curiosity always trumps indifference. I really wanted to know what happened to Lillian Poupard, what was her maiden name, her real background and the remaining chapters of her life story? So far, my efforts have hit the proverbial brick wall. Lil’s story seems to have left no footprint, at least not a digital footprint, that can be followed. Searches of obituary indices and ancestory, newspaper databases have offered not a trace. So far. I did have a bit more success in finding some information about William Poupard, including his date of birth, June 11, 1895 and that he was born in Toledo and registered for the World War I draft in 1916. He was listed as a fisherman at that time. Beyond that, not much else except for some listings in the Toledo city directories along with other Poupards, also listed as fishermen living in the 3500 block of North Erie Street. It must be noted however that the Poupard name was and is not a rare name in both Lucas County and Monroe County over the years, and there were a number of Poupard men with the first name of William. Not sure if it is relevant, but some research of census records does indicate that two brother, by the name of William and Fred Poupard, born around 1895 were residents of the Miami Children’s Home about 1903. And both boys listed their parents as having been born in France. Could this be the William and Fred Poupard who once lived on Odeon island, with Lil Poupard in 1934? Maybe so, maybe not. 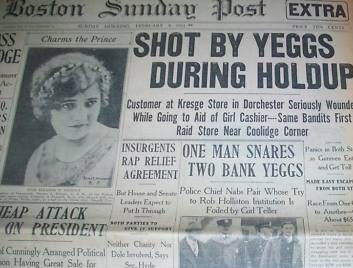 If you know, or know someone who knows more about the “Mistress of Odeon Island”, and the Poupards, I’d like to share that story with the Toledo Gazette readers. For Lillian Poupard, according to the 1934 News Bee story appeared to be good person, a gentle soul, and someone whose life was probably much larger than an obscure article in a faded newspaper. Someone worth knowing. 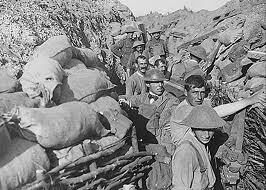 By the time the United States entered World War One in the spring of 1917, the earth had already been shuddering with the thunder of battle for three years through Europe and on the high seas. Many Americans, but not all, were ready to join the fight against the Kaiser and put an end to the long nightmare of German ambition. Toledo, like the rest of the country, sent her boys to the front to help in the cause. During this time, the news stories of the day reflect an emboldened American spirit of pride and patriotism and a compliant willingness to sacrifice both blood and treasure to the effort. Toledo did both. Thousands of dollars of were raised to help fund the war through what were called Liberty Loans and Toledo was one of the top leaders in the country for such fund raising, and likewise, Toledoans also offered thousands of young men to fund the need for human lives on the front lines in France, in what would become a brutal trench war of attrition against the hated Germans. By the time it was over on November 11th, it had been the costliest war in terms of human life, in the history of humanity. Over 8 million dead. For the United States, 116,000 military troops died in battle or from disease or accidents in the short 19 months of deployment. Over 400 young men from the Toledo area would not return home alive, having died on the battlefield, or of disease or by accident. The Toledo News Bee newspaper at the time was a great repository of war information, reporting daily on the situation at home and abroad. One of the most poignant features I found in the pages of the newspaper were the letters from Toledo “Yanks” serving in France during those months just before the fall of the Germans in November of 1918. The letters lend a human perspective to the events. A truly American perspective through the eyes of young men, many of whom had never traveled much beyond Lucas County, but whose sensibilities were now transported to a strange new world against the harsh landscape of war that would change their lives forever. For some of the Toledo soldiers, the adventure of war also involved other adventures besides those on the battlefield. Louis Gerding of Toledo wrote to his mother Ann Gerding of 119 Maumee Avenue about his new kindled friendship with a “French girl”. Other Toledo soldiers wrote of their eagerness to defeat the Germans and come home.